So you think copyright law doesn't really apply to your church, since you're a non-profit? Or maybe you figure no big time copyright lawyers will come knocking on your door over something printed in your modest church newsletter? A Massachusetts Conference church recently received a letter demanding $2,500 in damages for printing a copyrighted poem in their monthly newsletter. A parishioner had used the poem - The Dash, by Linda Ellis - in a tribute to his mother written for Mother's Day. 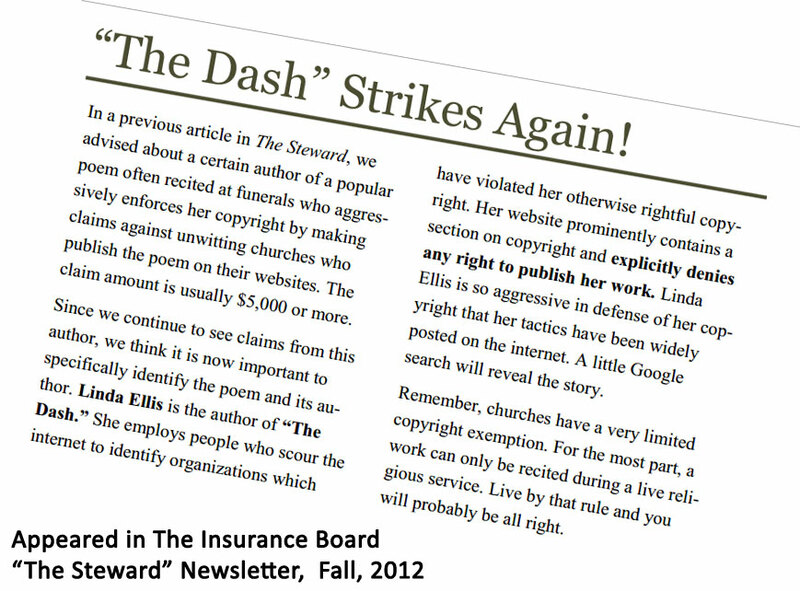 As it turns out, the poem, which pays homage to "the dash" between a person's birth and death dates, is often read at funerals, and a number of churches, synagogues and other organizations have made the mistake of printing it in newsletters and posting it online. Some have received letters seeking $5,000 or even $7,500 in damages, according to various articles online. Ellis' website explicitly denies anyone the right to publish her poem, and she is known to aggressively pursue those who print or post it without permission. In this particular case, the church was covered by its UCC Insurance Board policy, and the Board negotiated a settlement with Ellis. And while the details surrounding The Dash seem to be unusual, it should serve as an important reminder about copyright. Just because something can be found on the Internet - whether it is a poem or a photo or a news article or a piece of clipart - that does not mean it can be freely copied. Even items that do not explicitly state they are copyrighted may in fact still have legal protections. Never copy something and publish it unless you are sure that is permissible. When in doubt, ask the owner of the source website. Copyright and the Church - a comprehensive overview article on copyrights, licenses and more on the United Church of Christ website. This link leads to a whole section on copyright and church music by The United Methodist Church General Board of Discipleship. It is well worth exploring, and includes articles on live streaming worship, printing hymns in worship bulletins, etc. Yes, more recent translations of the Bible are copyrighted. The New Revised Standard Version may be quoted and/or reprinted up to 500 verses without express written permission of the publisher, if done so as stated on this page by the National Council of Churches. We've all done it. We need a photo to illustrate something, and we turn straight to Google Images. But keep in mind, many of the images found this way are copyrighted. Here are some sources for images that explicitly give permission for them to be used. freeimages.com - free stock photos. Be sure to read the restrictions/requirements of the photograph who uploaded the photo you wish to use.